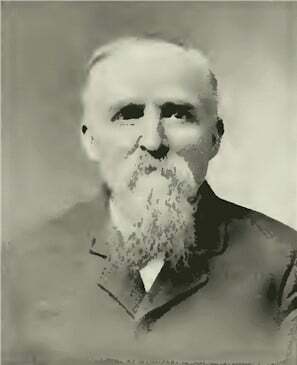 James W. Boyd, a prominent and substantial agriculturist located three miles west from Nez Perce on one of the choicest farms of this section, is the son of Robert and Sarah (Reed) Boyd. The father was born in Ireland and came to this country with his parents when he was four years of age. They located in Ohio and there he grew to manhood and married. Later he removed to Carroll County, Illinois, where the subject of this sketch was born on February 5, 1847. The mother of our subject died when he was an infant and then the father took him to Washington County, Iowa, where he grew to manhood and received a good education in the public and high schools. The father was a prominent and wealthy farmer of that County and James remained with him until his death. Previous to that death, however, James had engaged in coal mining. Then he went to Hastings, Nebraska, and began the manufacture of barbwire. Soon he returned to Iowa and on November 13, 1879, occurred the happy event of his marriage with Ruth McNay. They returned to Hastings and one child was born to them. Lena R., who is now attending a business college in Denver, Colorado, having also graduated from a literary college there. Mrs. Boyd died on December 7, 1880. Following her death, Mr. Boyd closed out his business and went to Helena, Montana, where he did dairying for a time, later returning to Gage County, Nebraska. He engaged in different occupations there and in 1889 Mr. Boyd came to Tacoma, thence to Centralia and later to Moscow, Idaho, where he followed prospecting for three years. But at the time of the opening of the fertile Nez Perces reservation. Mr. Boyd was ready to locate and so secured one of the most valuable claims in this favored section. He had much to endure to open up the land and make a good home single handed, but he has persevered and Has now] one of the excellent estates of the country. In addition to this property, Mr. Boyd has an interest in the Farmer’s Grain Company which owns tramways and warehouses. Mr. Boyd has been an extensive traveler and has seen much of the ways of man as well as exploring many of the interesting places of the United States. In 1876 he visited the Centennial at Philadelphia and at that time also visited most of the important cities of the east, not missing, of course, the great Niagara Falls. During 1870 he traveled in California and almost every portion of that state is familiar to him. We are also glad to add that Mr. Boyd is of exceptionally good standing in the community, being respected and esteemed by all who know him. Biography of John G. Lenz, M.D.